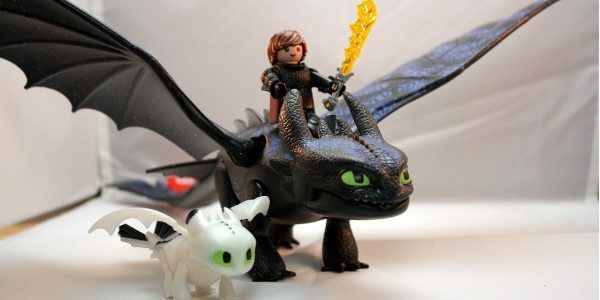 Playmobil swoops in with great new toys based on the next movie in the How To Train Your Dragon franchise. It’s another few weeks before How to Train Your Dragon: The Hidden World opens, but that doesn’t stop Playmobil with coming out with a killer toy line. I ended up Hiccup, Toothless, and a baby dragon. See what we saw in the trailer and how the baby looks like a white version of Toothless, one can only assume he got “busy”! But all joking aside this set is awesome! Starting with Hiccup, he comes dressed in dragon armor and come with the flaming sword that was introduced in the previous film. Hiccup also comes with removable hair. One is his normal hairstyle. The other is one that will fit under the helmet. Standard Playmobil movement here. Toothless is awesome on a massive level here. 13″ long. The wings and legs move. There’s a little “seat” where you can put Hiccup so he can ride Toothless. The tail flaps are removable on one side, you can either choose a natural fin or the one Hiccup created in the first movie. Toothless also comes with 3 fireball missiles. The missiles have soft heads on them, but still be careful with them. You put the missiles in his mouth, and then squeeze down on the back of the head to fire a missile. And, what I think is the coolest, is Toothless comes with a light up feature on his back fins. It’s very easy to use. Just remember to pick up one AAA battery to use this feature. Finally, there’s the baby dragon. The baby is white and looks like a mini-me. The legs and wings movie. The jaw opens and closes as well. This is really a great set. Now I just have to get the rest of the collection! You will be able to find this set where ever toys are sold! It’s such a great toy!